That all changes abruptly when the puddle freezes. In contrast to liquid water, ice is a crystal, and it gains a spontaneous rigid structure as the temperature drops. Freezing fastens neighboring water molecules together in a regular pattern, and a simple tilt of the head now creates a kaleidoscopic change. In 2012, Nobel-prize winning physicist Frank Wilczek, a professor at the Massachusetts Institute of Technology, proposed something that sounds pretty strange. It might be possible, Wilczek argued, to create crystals that are arranged in time instead of space. The suggestion prompted years of false starts and negative results that ruled out some of the most obvious places to look for these newly named time crystals. Now, five years after the first proposal, a team of researchers led by physicists at the Joint Quantum Institute and the University of Maryland have created the world’s first time crystal using a chain of atomic ions. The result, which finally brings Wilczek’s exotic idea to life, was reported in Nature on March 9. 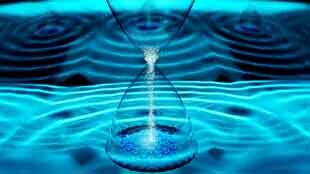 A time crystal doesn’t follow the lead, instead responding with a slower frequency—like a bell struck once a second that rings every other second. The atomic ions in the Maryland experiment, which researchers manipulated using laser pulses, responded exactly half as fast as the sequence of pulses that drove them. 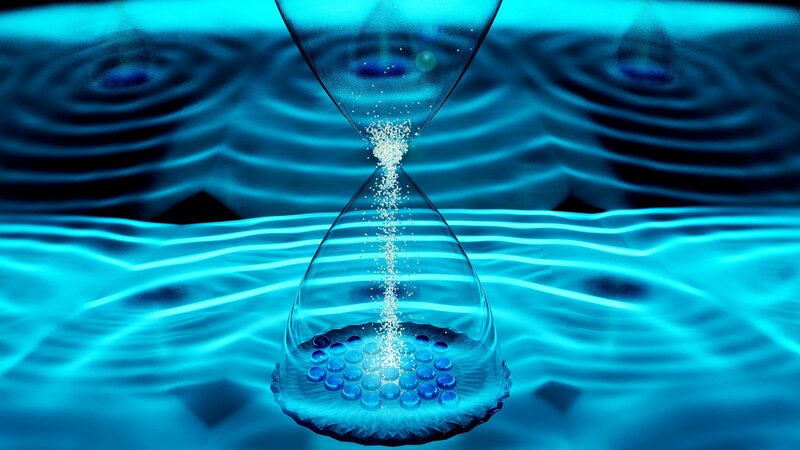 Zhang, JQI Fellow Christopher Monroe and a group of experimentalists at UMD teamed up with a theory group at the University of California, Berkeley to create their time crystal. The Berkeley group, led by physicist Norman Yao, had previously proposed a way to create time crystals in the lab. For a chain of atomic ions, the challenge came down to finding the right sequence of laser pulses, along with assembling the sea of mirrors and lenses that ensured the lasers impinged on the ions in the right way. To create their time crystal, researchers activated three types of laser-driven behavior in a chain of ten ytterbium ions. First, each ion was bombarded with its own individual laser beam, flipping an internal quantum property called spin by roughly 180 degrees with each pulse. Second, the ions were induced to interact with each other, coupling their internal spins together like two neighboring magnets. Finally, random disorder—essentially noise—was sprinkled onto each ion, a feature known from previous experiments to prevent the spins from jostling and heating up the chain. Altogether, this sequence twisted around the ions’ spins, and researchers kept track of the orientation of each spin after many repetitions of the sequence. When all three laser-driven behaviors were turned on, the spins of each ion synced up, and they would rhythmically return to their original direction at half the speed of the laser sequence. Zhang and his colleagues demonstrated that their ions had this rigidity by attempting to artificially “melt” the time crystal. By modifying one of the laser pulses—essentially shaking the table—they observed that the rhythm remained stable, up to a point. Past a certain amount of heating, the time crystal dissolved away, just as an ice cube can melt back into a small puddle of water. But with weak shaking, it remained stable, a fact that provided the key evidence that they had created a time crystal. This rigidity makes time crystals a potential ingredient for clocking complex quantum systems that have inherent defects and are hard to control. They could have applications to future quantum computers, which will also need to be robust. But such applications are still a long way off, especially since the time crystal that Zhang and collaborators produced lasted less than a millisecond. In the same issue of Nature, a group of researchers from Harvard University, also working with Berkeley’s Yao, reported the creation of a time crystal using just such a solid-state system. Instead of ions, they used natural defects found in diamond to set up their crystal. This work was supported by the United States Army Research Office, the Air Force Office of Scientific Research (Award No. FA9550-14-1-0035), the Intelligence Advanced Research Projects Activity, the Intelligence Community Postdoctoral Research Fellowship Program, the National Science Foundation, the Miller Institute for Basic Research in Science, the Simons Investigator Program, and the United States Department of Energy (Award No. DE-AC02-05CH11231). The content of this article does not necessarily reflect the views of these organizations. The research paper, “Observation of a discrete time crystal,” Jiehang Zhang, Paul Hess, Antonios Kyprianidis, Patrick Becker, Aaron Lee, Jake Smith, Guido Pagano, Ionut-Dragos Potirniche, Andrew Potter, Ashvin Vishwanath, Norman Yao and Christopher Monroe was published March 8, 2017 in the journal Nature.